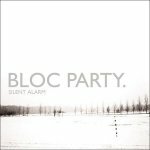 You can stop thinking of buying any other records this year; "Silent Alarm" will be the most important purchase you make in 2005. From the angular intro of "Like Eating Glass" to the calming finishing track "Compliments", Bloc Party create a whole new type of mood. Guitars are going all over the place in a complex rhythm on songs like previous singles "Helicopter" and "Banquet", whilst on the tender track "This Modern Love", harmonies come to the forefront. Some times screaming over a tangle of guitars, sometimes singing softly, vocalist Kele Okereke leads Bloc Party to war, so to speak. It is that powerful. There are no bad songs on this album. Not one. Of course, this makes it hard to choose a single favourite. However, out of all the brilliant songs on "Silent Alarm" from "Helicopter" to "She's hearing voices" to "Banquet" to future single "So here we are", it is quite difficult to select the one that sums the album up in the best way. However, the choice becomes apparent after a few listens. "This Modern Love" is the master and centrepiece of the album. Summing up the sound and reach Bloc Party have got in less than five minutes, it is filled with guitar riffs, harmonies and lyrics that actually describe what can be called a modern sense of love. Melancholic, gorgeous and utterly magnificent. "Do you wanna come over and kill some time?" are finishing words perfectly apt for a song that deals with the mundane nature of modern love affairs..
"Silent Alarm" is the sum of countless influences and is thoroughly inspirational, emotional and wonderful. I know we write this quite often, but you will need to hear this album. Forget Franz Ferdinand, Babyshambles, Kasabian, whoever. Bloc Party, a bunch of self-confessed geeks from London, have made the music that will be played in teenagers' bedrooms for years to come. I know metal-heads and punks who have fallen in love with this album. You can't judge it until you've heard it. It doesn't really fall into any one genre. It's just the best thing you will have heard in quite a while.